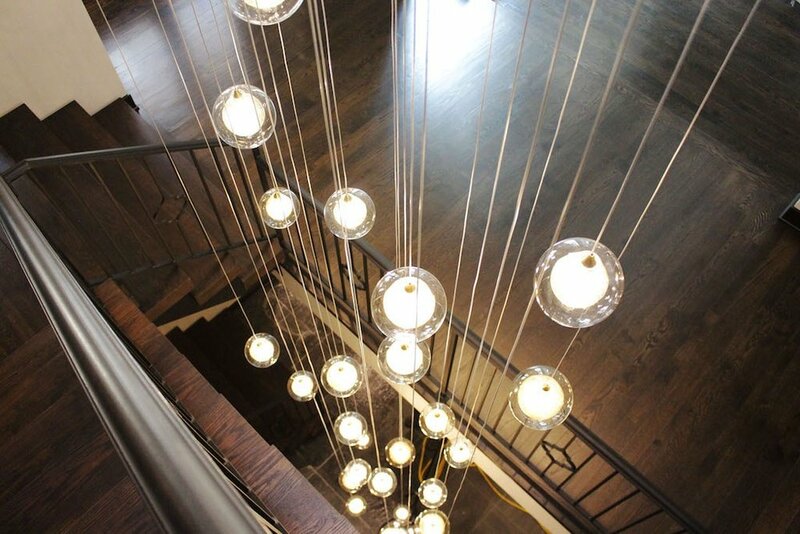 Whether engineered or solid, these insights will help you keep your hardwood floor in good shape. Sweep, dust and vacuum your floors. If using a vacuum, attach the proper hard floor adapter to avoid scratching the finish of your wood. Wipe up spilled water immediately. Dry any standing water as soon as possible. Even surface finished hardwood can suffer water damage. Use entry mats and floor protectors. Implementing the use of entry mats in high traffic areas and floor protectors underneath heavy furniture can increase the lifespan of your floor. Ask us for some felt floor protectors, and we'll hook you up. Rearrange Your Furniture Periodically. Let your flooring share the load as evenly as possible by redirecting high traffic each time you move your furniture around. BONUS. So here’s another cool tip: If you drop gum or candle wax onto your floor, you can remove it by first hardening it by rubbing it with an ice cube and then scraping it off with a plastic card. 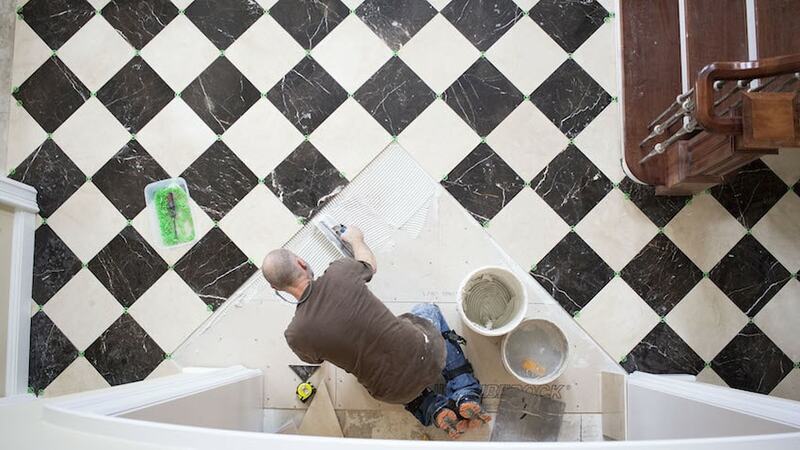 Keeping your ceramic, porcelain, or natural stone tile at its best. Sweep or vacuum first. Before using any cleaning solutions on your tile, remove dirt and debris with a soft-bristled broom or vacuum with a hard surface attachment to avoid putting scratches in your glazed tile. Glazed tile cleaning. Mmmm… glazed. After sweeping or vacuuming, clean your tile with an all-purpose (non-oil-based) household cleaner. Mixing some water with a mild detergent also works. If you’re feeling creative, you could introduce an acidic ingredient like fresh lemon juice to your cleaning solution, effective for removing soap scum and alkaline type stains. Don't add an acidic solution to your cleaner if you're cleaning marble or other natural stone flooring. The pH balance in your cleaning solution needs to be neutral or it will break down your material. Read more about caring for your natural stone flooring in this article. Unglazed tile cleaning. Unglazed ceramic or porcelain (man-made) tile lacks the melted glass coating of its glazed counterpart. It’s a lot less slippery when wet but more porous which means you need to be more gentle when cleaning it. Hot water and white vinegar mixture is recommended. The vinegar mixture is great especially if you have kids and pets since it’s chemical-free and safe if ingested. Cotton, microfiber, or chamois-style cloths. Avoid using sponges or sponge mops as they tend to push dirt and grime into cracks and grout joints. Grout Joint Cleaning Tip. Mix baking soda and water together, forming a paste, and rub it onto your dirty grout joints. After letting it sit overnight, scrub the grout with a stiff nylon brush. Repeating this step to get your desired results may be necessary. Reseal your floors. 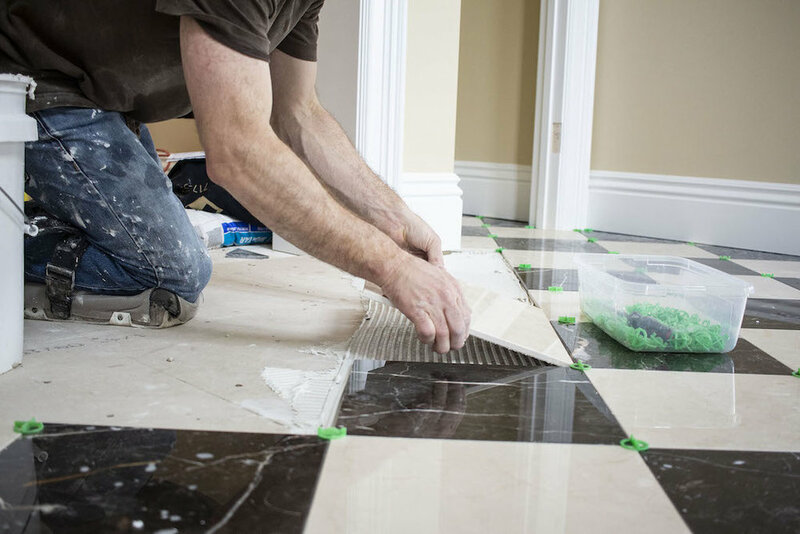 If you want your tile installation to keep looking good and remain mostly impervious to stains, seal them after installation then reseal them every year to 2 years. If water doesn’t bead on the grout lines, it’s probably time for the resealing regimen. Protection. Tile is strong, but it still suffers wear and tear. the use of mats in high traffic areas and floor protectors underneath furniture is recommended. 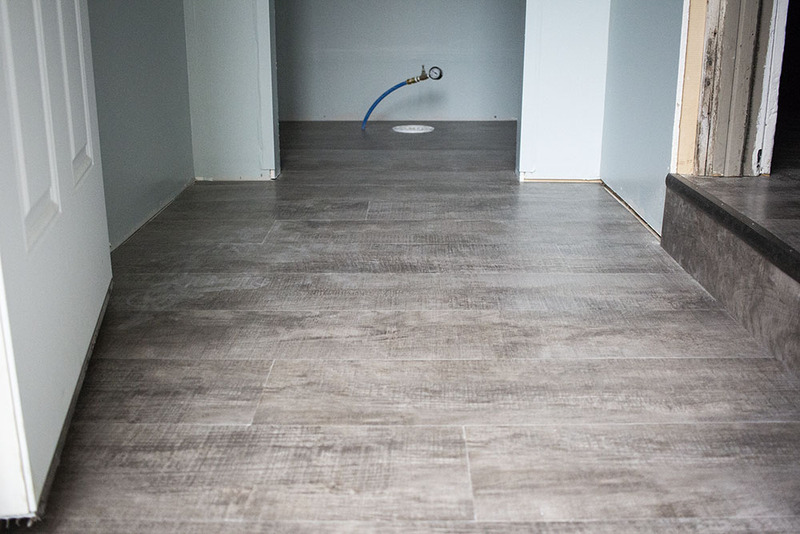 Follow these tips to keep your resilient vinyl flooring (Sheet/LVP/LVT) in tip top shape. Immediately following installation. Keep foot traffic to a minimum. And for glue down vinyl, avoid putting furniture on the floor until after the first 24 hours. Clean Daily. (Or at least make that your aim) Clear your floor of potentially damaging dirt and grit by dust mopping or sweeping every day. Having good entry mats can cut down on the amount of dirt and oil tracked inside from the great outdoors. Clean spills immediately. Vinyl is waterproof but leaving a spill standing on your floor for a long period of time increases the chance of staining. Protection. Hopefully you get this by now. 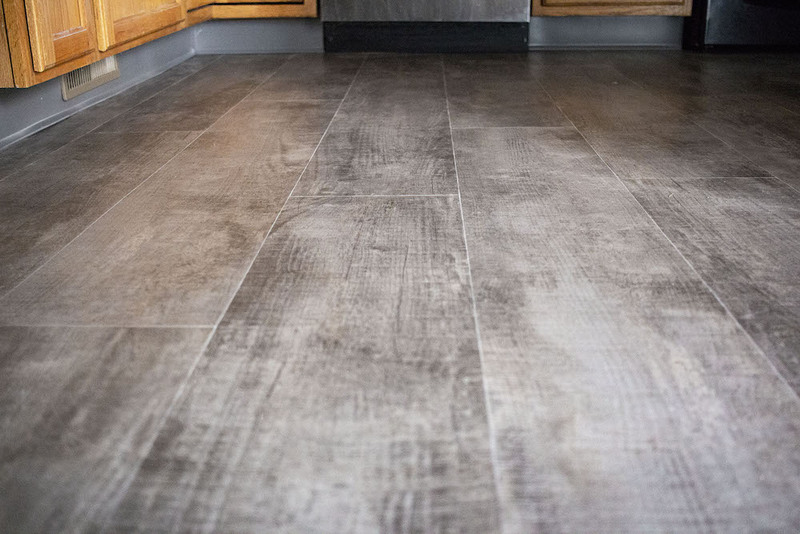 Protective mats (without rubber or latex backing) at high traffic areas and pivot joints (like in front of your kitchen sink) can increase the longevity of your floors and prevent visible wear spots. Floor protectors (plastic or felt) that are non-pigmented and at least an inch wide are recommended. Avoid direct sunlight. This is a tip for all flooring and furniture, really. Lower the blinds during bright times of the day to minimize direct sunlight on your floors. Over time, it can cause discoloration. Excessive temperatures can also cause expansion of the vinyl material. While some companies are coming out with dimensionally stable options, it's still a good tip! Do not use vinegar or soap or detergents. Soaps and detergents can leave a dulling effect on your floor's finish. Use an approved resilient vinyl cleaning solution like Shaw Flooring’s R2X Hard Surface cleaner or Mannington Flooring’s Rinse-Free Cleaner. Do not use a vacuum with a rotating beater bar. It could scratch your beautiful floor, and again, that would be so sad. Whether cut pile, loop, or the cut and loop carpet combo, follow these maintenance and cleaning care tips for your maximum carpet satisfaction. Install the Right Pad. 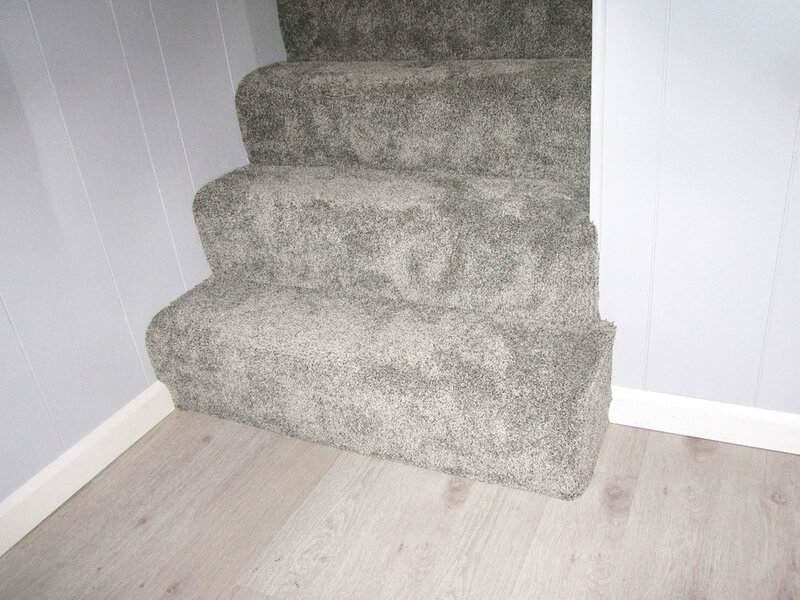 During installation, get it right from the beginning with the proper carpet padding, especially on stairs. Check the carpet's warranty recommendations and explore your carpet pad options. Don't Track Dirt Inside. This is so obvious it's almost funny. But seriously, make your life easier and make your carpet's life longer by having good walk-off mats to keep the dirt, grit, soil, and asphalt outside and off your carpet. Vacuum Regularly. This is stated by one of our main supplier's as the most important maintenance tip. In light of this and the myriad of vacuum cleaner options on the market, we've included a link below to help you make an educated vacuum cleaner decision! We recommend that you then use that educatedly purchased vacuum cleaner to clean your carpets thoroughly, especially in high traffic areas. Treat the Affected Area Immediately. The sooner you can get at it, the better. The longer spilled foods or liquid stands on your carpet, the more likely they are to leave a stain. Clean Your Carpets Regularly. Using a hot water extraction method, clean your carpets every 12 to 18 months. 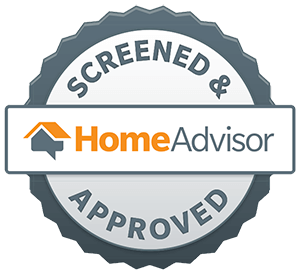 It's recommended to hire a professional cleaning service and one that follows the Carpet and Rug Institute Seal of Approval. A poorly cleaned rug can actually increase the rate at which your carpet breaks down. So make sure you don't cut corners here. Minor Repairs. Use scissors to cut back snags or loose piles. If the there are small burn spots on the carpet, you can use a pair of curved nail scissors to cut back the burnt tips. Spot Cleaning. When spot cleaning, completely remove the detergent or solution used to avoid any residual sticky residue that just attracts more dirt. Derry, our owner, would highly recommend using Shaw Flooring's R2X Stain & Soil Remover, which doesn't need to be rinsed out. Bonus! For 2 years now, we've had the privilege of giving away $1,000 in flooring materials to a lucky winner at our open house event. 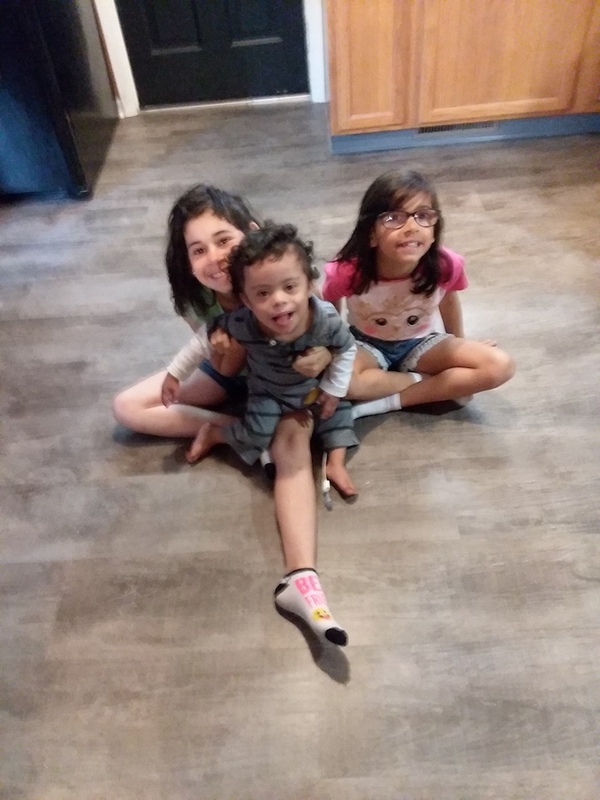 This year, a local resident named Mary won the prize, and their family excitedly upgraded their kitchen and mudroom flooring! 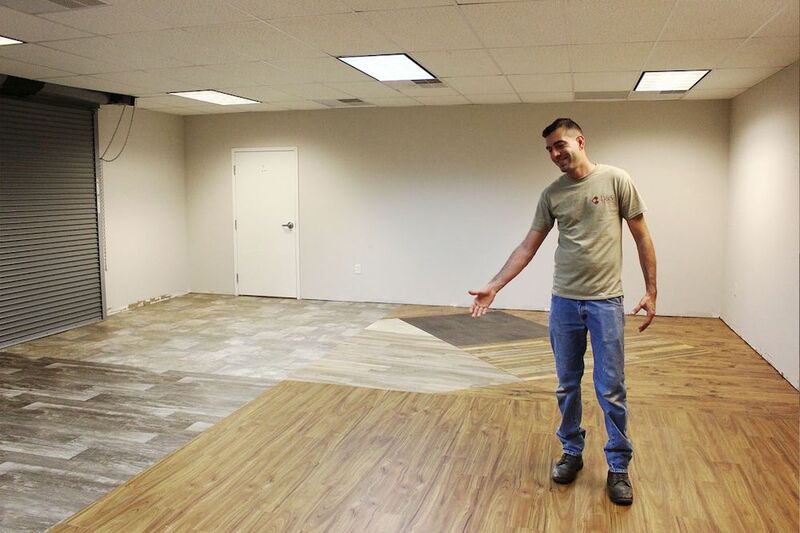 Josh Tangert, contract sales associate, walked Mary through the process of choosing the flooring material. He was also out at their home to take measurements in order to finalize the proposal. Mary and her son in the D&S showroom in Ephrata with Josh, selecting her flooring. Josh Plank, lead technician, managed the preparation, installation, and finishing of Mary's family's flooring from beginning to end. From moving furniture and appliances to special cuts, shoe molding, Josh created a beautiful finished product. Here are some photos of the finished product. 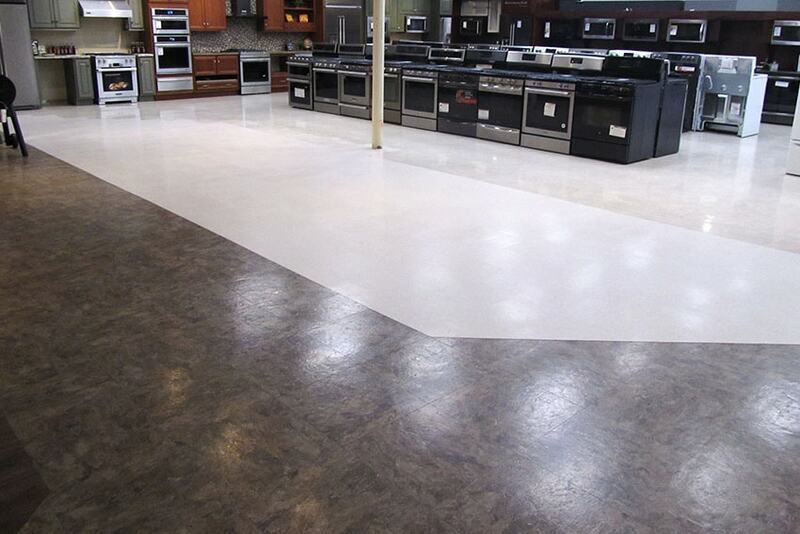 Mary chose an Armstrong brand vinyl click-together floating floor. A note about floating, click-together floors: One of the benefits of floating floors is less preparation time and in most cases, less material. 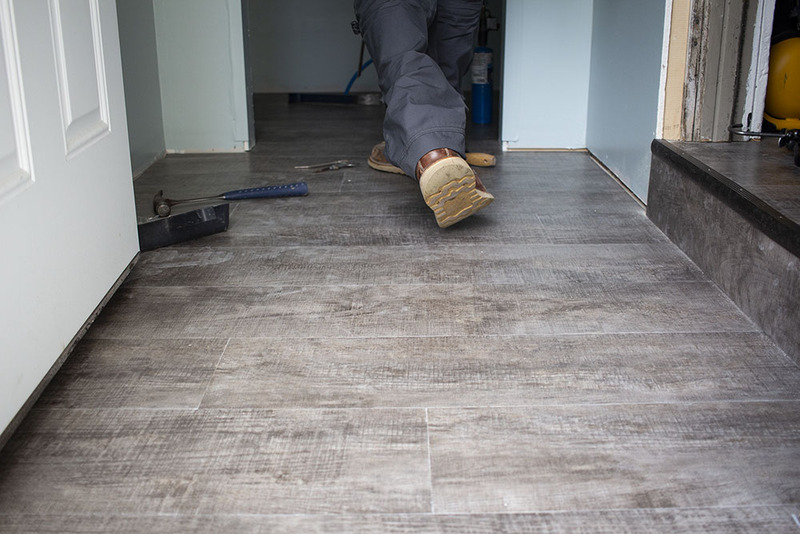 With vinyl sheet flooring, a 1/4" underlayment is often needed before the new flooring can be installed. Many of the click-together vinyl products come with a backing already attached. 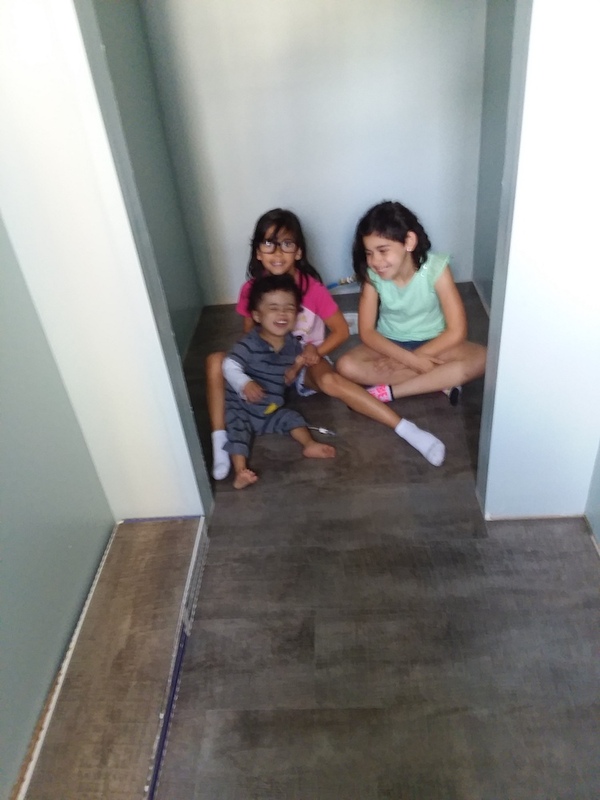 Plank Size: 9" x 48"
Mary's kids enjoying their new floor. We look forward to doing this again next year! When we are 'blessed' by God, we believe it's to be a blessing to our community and feel privileged to serve people this way.